Charles Duncan from the Raleigh Public Record spoke at the Hackathon about how journalists can provide greater transparency in local government planning decisions and actions. Photo by Sara Peach. 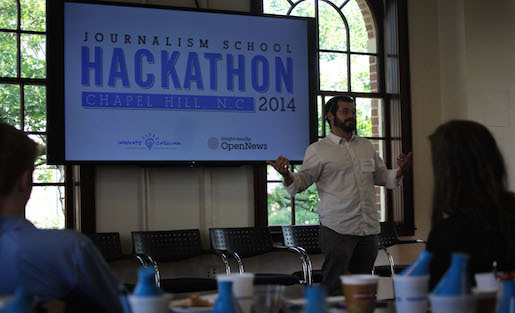 The Journalism School Hackathon that the Reese News Lab and PBS MediaShift hosted last weekend brought together journalism students from all over the country to tackle challenges of the media industry. We’ve rounded up a great collection of photos, video, coverage and a fantastic Storify from Reese News Lab. Did we miss anything? Please add it in the comments, and we’ll update the post. WRAL.com — How might we increase awareness of outside influence on local elections? McClatchy — How might we use high school sports to create tighter bonds within a community? Raleigh Public Record — How can we provide greater transparency into local government planning decisions and actions? Here’s a curated collection by Meghan Horton of Reese News Lab.